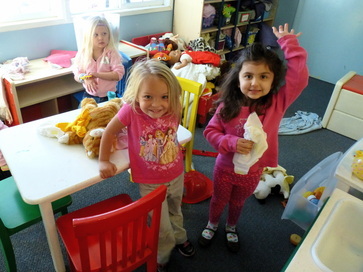 Our preschool year runs from the beginning of September through the first week in June. You may choose a 2-day, 3-day or 5-day program. Preschool hours begin at 9:00 AM. We offer half-day programs until 12:00PM or extended day programs until 2:00PM. Extended day children are asked to bring a simple lunch. After lunch time, there is a brief rest period and then, class time continues until school is dismissed. Our preschool follows a traditional school year calendar. We are closed for all major holidays, including a Christmas vacation and Spring Break. Special events include Halloween Parade, Christmas Program, Open House and year-end Graduation Program. Please contact us for our current tuition schedule.